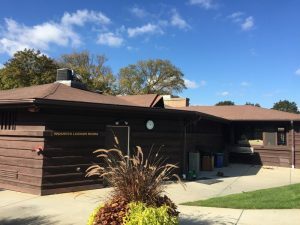 We recently did work on River Forest Tennis Club. 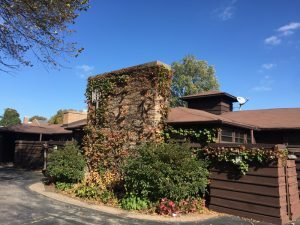 Our project manager, Chuck, stayed in touch with the owners of the building over a few years. 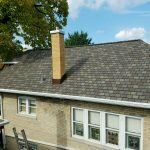 We provided our honest opinion and helped out with minor repairs until they were ready to replace the entire roof. From start to finish the job went without a hitch. We have some photos of the building prior to work, in progress and after completion. Please stop by to take a look at our handy-work! Below are pictures from a recent job in the 60659 zip code of Chicago. We wrapped the windows, soffit and fascia in aluminum as well. Get a quote from Lindholm for your next project click here! 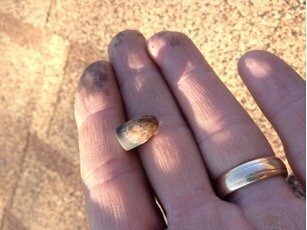 I’m one of the guys at Lindholm who gets sent to find out why your roof is leaking, and I thought I’d share some of the things I’ve found. While most calls bring me to a roof that has simply died of old age, if the roof is newer and I tell folks that I’m going to check for bullet holes they think I’m Kidding. 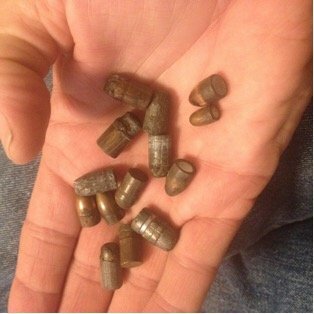 Doing this is, stupid, dangerous illegal, and not as rare as one might think…. 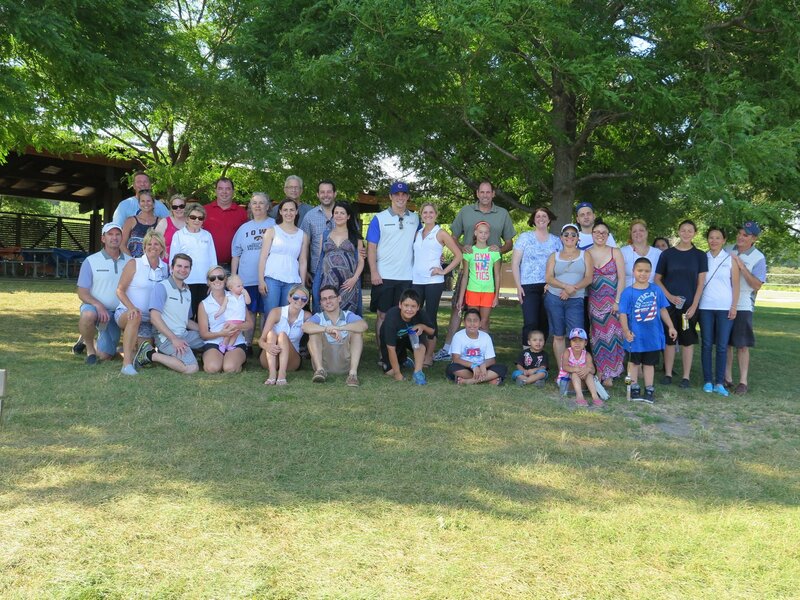 Better late than never…2015 Lindholm Roofing Picnic photo! 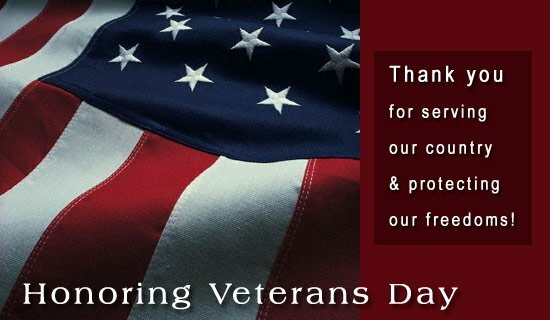 Happy Veterans Day from Lindholm Roofing! 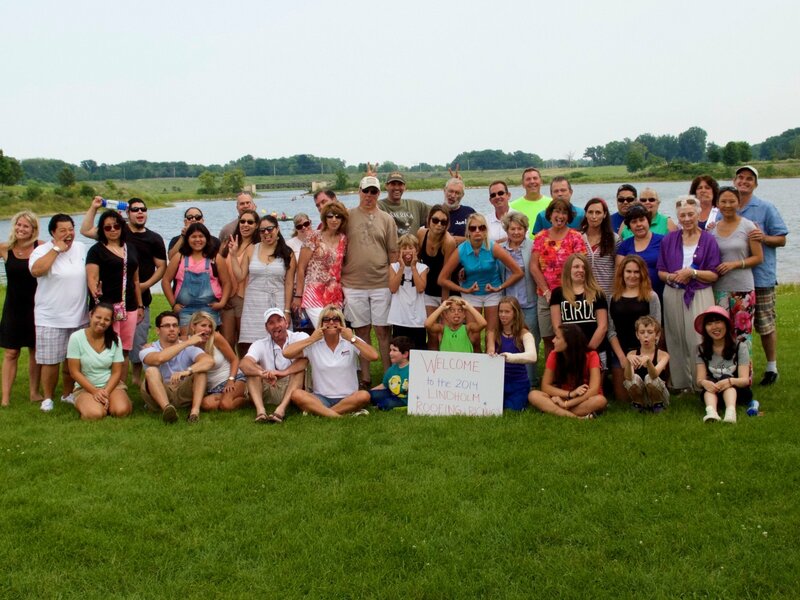 The company has another blow out party for the summer up at Independence Grove again. Check out our funny photo here. For more pictures follow us on facebook and see the entire album! Has your home or business been in the vicinity of a hail storm recently? 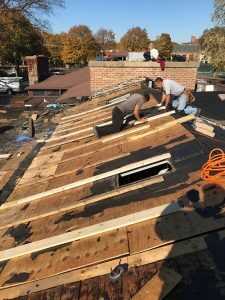 It’s not easy to see from the ground if your roof has experienced any major problems. Always have a trained roofing professional determine the extent of your damage. Hail damage can seem harmless. However, over a period of time, it can cause serious damage to your roof. The damage causes the roof to break down, and rain leaks begin to come into your home. 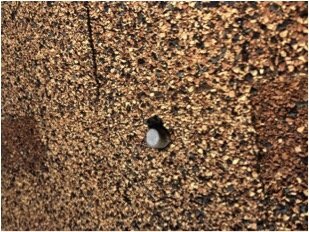 If you believe that there could be a chance your roof has suffered hail damage, you should have it looked at immediately. The nature of hail damage is that it may pose no immediate threat to the structural integrity of the roof. However, many insurance companies have a “statute of limitations” of how long a hail claim is viable. If you have experienced a loss such as hail damage, it is prudent to take care of the problem in a timely manner before it leads to other associated problems. Inspect your roof regularly, so that you can find and fix damage BEFORE it becomes a more costly leak. With regular inspection, you have information to compare roof conditions after a severe storm. You can document the date of damage and can establish whether the damage was or was not present before a particular storm. Any storm or wind alone can damage a roof. The sooner you inspect the roof after a storm the better you can avoid leak damage inside your home, which sometimes does not occur until months later. If an insurance claim for your roof is warranted, the documented damage you collected will provide supporting data of your claim. 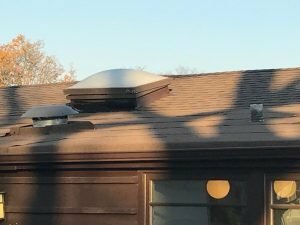 The first place to look is at the metal products that are on your roof (wind turbines, metal caps, etc). If they have noticeable dents in them, the shingles probably do also. Look in your gutters to see if the gritty granules on the face of the shingles have been knocked off and collected in the gutters. Look at your window screens skylights to see if they have been damaged. If branches have been broken from trees, damage has also occurred to your roof. What is the first thing I should do if I believe I have damage? 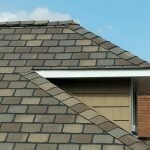 Call a local roofing contractor to set up an appointment to come out and take a look at your roof to determine if there is damage. Call your agent after you've had a roofing contractor come out to verify damage has occurred. It is important to make your insurance company aware of this severe damage. 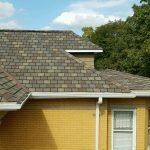 What is the insurance process if the roofing contractor tells me I have damage and need a new roof? Your first step is to call your insurance agent and request an adjuster to come out to assess the damage you have to your property. Not just your roof, but your gutters, fence, outdoor furniture, window screens, air conditioning unites, pool equipment, and pool furniture for damage. The adjuster will explain the claims process to you, and will let you know when to expect your money, and how much to expect. We will help mediate your claim by working with your insurance adjuster on your behalf. 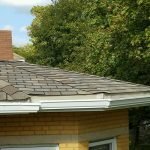 Do I have to pay Lindholm Roofing for their claims management? No, we will assist you with your claim from start to finish for FREE. We will work with your insurance company to find the best solution for your home or business. Can I get the depreciation back? In most cases, yes. Depending on your residential policy, most insurance companies hold back depreciation. That will be provided to you after all the work is completed. There are many small details and factors that can apply to each specific claim. Should I ever give money to any contractor up front? Only in rare occasions should a contractor ask you for any money up front. A deposit may be required if non-returnable materials are special ordered for your roof. A deposit may also be required if your insurance company doesn't cover the repairs that you need. 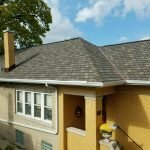 But most reputable roofing companies will finance their own jobs. 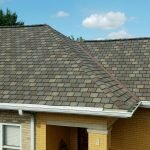 Do I have a choice of roofing materials? Absolutely. We represent many roofing manufacturers, and can give you many options on material and color. Are you able to give me ideas on how to better ventilate my attic space? Yes we can, we provide insulation and ventilation services. Call in and speak to one of our project managers for more information. We're more than happy to answer any questions that you may have. 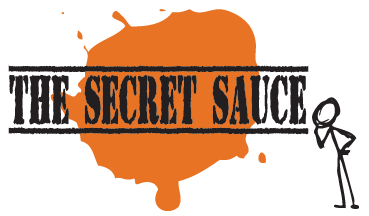 For answers, or for a free quote, call 773-283-7675 or fill out the quick contact form located on our contact us page. 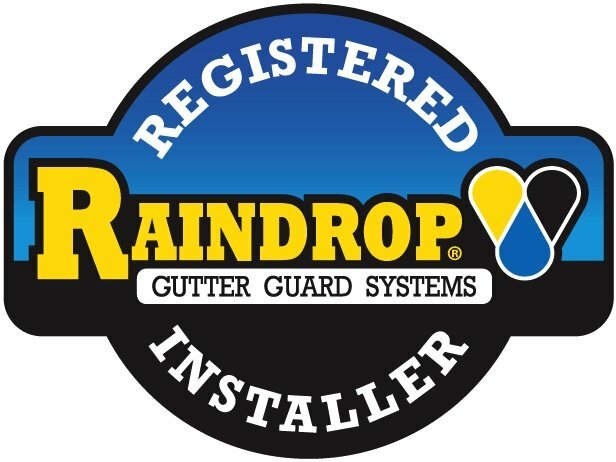 When the weather warms up a bit this Saturday and the water starts pouring in, a lot of people will be calling us about their roof or gutter problem; but actually it might not be something that a roofing or gutter professional could have prevented. Ice dams are often unpreventable when weather conditions are just right. I even have icicle on my roof! So let’s see what’s going on and discuss how to lessen the impact now and in the future. Ice dams are commonly caused when snow melts from heat loss in the attic; water then runs down the roof underneath the snow blanket and re freezes at the edge of the roof. 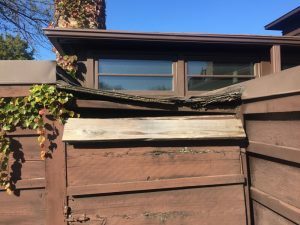 This frozen melt water eventually forms a dam preventing the escape of further water which backs up under the roofing and leaks into the soffit, wall cavities and living space. The deeper the snow, the bigger the potential problem, piles of snow equal gallons of water, waiting to drain into the unfortunate victim’s house. Make it stop! Without killing yourself. It is difficult to stop this process once it has started. Removing the dam that blocks the water would be great if only it was so easy. 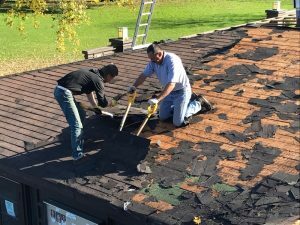 Chopping at built up ice is nearly useless, (it refreezes and reforms quickly), and every spring we see roof edges damaged by frantic homeowners who have attacked their roofs with sharp objects at great risk to their personal safety. Wielding an ax while standing on a snow covered ladder, is asking for a trip to the ER. Some get mixed results throwing salt up on the roof; the downside is certain damage to the plants and possible corrosive damage gutters and flashings. Removing built up snow will lessen the available future melt water, and using a roof rake designed for the purpose makes it fairly safe. Blowing cold attic air at the worst spots from inside the attic with a box fan may help to refreeze the lake that has formed behind and under the ice dam. It is always safest and best to have a professional roofing contractor remove built up snow, call us, we can help, we’ve been doing this since 1949. Make next winter better step #1 stop the heat loss. The contractor with the most to do with stopping future Ice dams isn’t your roofer but your insulation contractor. Heat loss from the living space that warms the underside of the roof is the number one controllable cause of ice dams. Look at unheated garages, no heat, no melting and no big icicles (a sign of ice damming). A good insulation contractor can use an infrared gun to find hot spots where heat is escaping into the attic space, causing ice dams and wasting energy. Sealing these air leaks, and insuring that the insulation blanket is up to snuff, will save money and do the most to lessen the return of lake ice dam. Once the attic blanket is in great shape the next thing is to make sure that there is great ventilation. Even with a well-designed insulation blanket you need ventilation to keep the roof cold from top to bottom, here we can help. All Lindholm Roofing project managers take recurrent training to stay on top of the latest in ventilation technology and are ready to suggest solutions that will improve the attic environment in both winter and summer, saving money, energy, and lowering the odds of future ice dam damage. 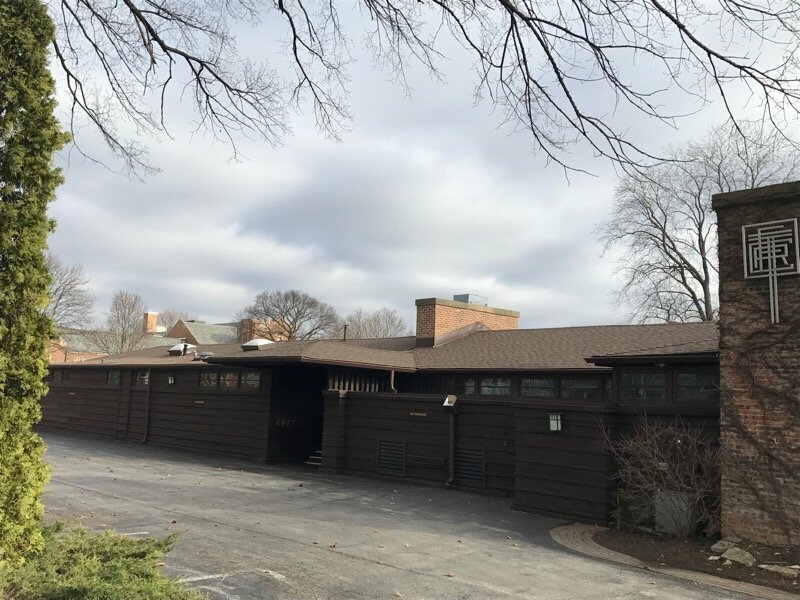 When it is time to get a new roof, be sure to call us, and be sure to mention the winter ice problems. 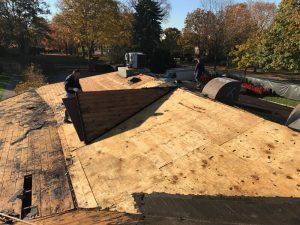 It is best to tear off the roofing to check for damaged sheeting, and there may be problem areas that would benefit from extra ice-shield membrane. 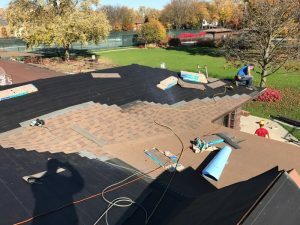 There are heat mats designed to be installed under a new shingle roofing, cold roof deck designs, or even the traditional heat cables for problem houses. While we can’t keep all ice dams from forming, with the right steps we can make them a lot less likely.